Satsuma marmalade had been on my to-do list for ages when I learned of a marmalade competition being held within walking distance of where my mother's family lived in Cumbria (England) for centuries. How could I resist? I immediately gathered my fruit and walked down to the shops to buy new lids for my half-pint canning jars. One must always use new lids for water-bath canning. Making marmalade is a bit of work, no question. Is it worth it? That's a matter of opinion, but to me, yes. The flavor is brighter than any marmalade you can buy, and just look at it. 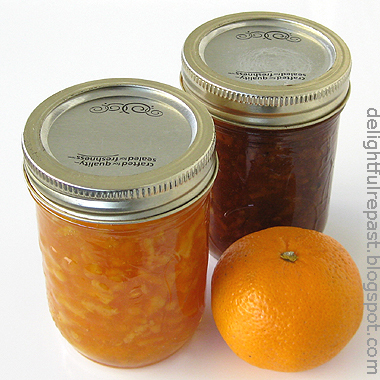 Satsumas are a winter fruit, but doesn't Satsuma marmalade look like sunshine in a jar? I also made a batch that I cooked longer to make a caramelized, dark marmalade with an entirely different flavor. You don't even need any special equipment really. I haven't had a big canner with a rack and all that in years. All you need is a big pot with a folded kitchen towel in the bottom (see the recipe for more details). Since it's impossible to get the wax and pesticides off the peel of conventional fruit, and marmalade is all about the peel, do use organic Satsumas and Meyer lemons. Through much experimentation, I've come up with what I think is really the easiest, least messy and complicated way of making marmalade. You will see many recipes that have you measure the boiled fruit and water mixture to determine how much sugar to use. Fuhgeddaboudit! Just weigh your fruit whole and use an equal weight of water and sugar. Two pounds (907 grams) of fruit? Then two pounds of water (that's 1 quart, or 32 fluid ounces) and two pounds of granulated sugar (that's 4 1/2 cups) and be done with it! Marmalade seems to be one of those things people either love or hate. But even if you hate store-bought marmalade, you should try homemade. It's an entirely different matter! Tell me your views on the subject (and whether you're a Paddington Bear fan)! 1 Scrub the fruit well. Peel the Satsumas (you can just pull the peels right off). Cut the peels into short (aiming for 1/3-inch, some will be 1/4-inch, some will be 1/2-inch), very narrow* strips. 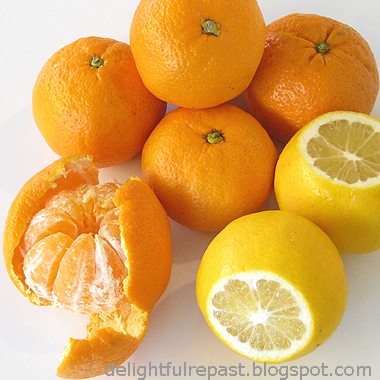 Coarsely chop the peeled Satsumas; no seeds (pips) to remove. Halve the lemons lengthwise, slice them crosswise very thinly, remove the seeds and cut each slice into 4 pieces. Cutting the fruit on a plate helps contain the juice. * Just how narrow? Well, in marmalade there is fine-cut, medium-cut and thick-cut. There doesn't seem to be any agreement on specific measurements, but I'm going to give you my definitions: fine-cut 1/16-inch or 1.5-mm, medium-cut 1/8-inch or 3-mm, thick-cut 3/16- to 1/4-inch or even up to 8-mm. I was aiming for fine but got something between fine and medium. 2 In heavy, wide, nonreactive 4-quart pan (I use my 5.5-quart Le Creuset French oven for a jam kettle), combine fruit, peel and water. Bring to a full boil. Boil, uncovered, for 7 minutes; no need to stir. Remove from heat, cover and let stand at room temperature for 2 hours. Refrigerate for 8 hours or for a day or two. 3 When ready to make the marmalade, get your jars ready. Get out canner (or large pot deep enough that water will be 1 to 2 inches above the tops of the jars), two kitchen towels, 2-cup glass measure, thermometer, jar lifter, tongs, half-pint jars, new lids, bands. Put a saucer in the freezer for testing the doneness of the marmalade. 5 Bring fruit mixture to a boil over medium-high heat. 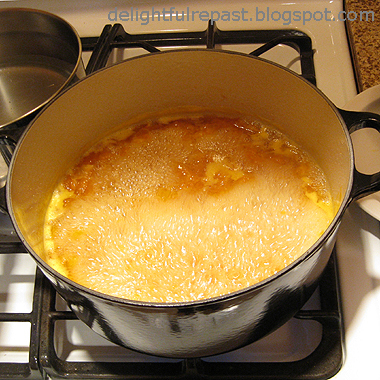 Boil gently, uncovered, about 20 minutes, or until peel is tender. No need to stir at this stage. (If I didn't use the weight method, I would then at this point in the process measure the mixture, pouring it into a 2-quart glass measure, return it to the pan and stir in a cup of sugar for each cup of fruit mixture. But if you're doing the weight method, just stir in 4 1/2 cups of sugar all at once until dissolved. Note: You might also like my Strawberry Freezer Jam and Peach Freezer Jam. Fantastic Jean. I love the D H Lawrence quotation and the reference to your family links in Cumbria. It's a shame you couldn't enter the competition yourself. Village fetes over here have cake baking, jam making,fudge and toffee amking, competitions. Vegetable growing competitions such as marrows,cucumbers, artichokes and many other vegetables are big too. You would be in your element over here. Just one more comment Jean. Your gas hob looks very nice. Do you use a gas and electric combination? We have a gas hob and a separate electric oven. Thank you, Tony! I would sooooo be in my element over there. (sigh) And, actually, I *did* enter this competition! I'll be writing more about it later, so I didn't really say so in the post. Tony, when I remodeled the kitchen six years ago and replaced my old stove (hob, cooker), my goal was to get one with all the mod cons that did not *look* modern. So I liked the rounded contours of this white stove. It's 30 inches wide, with continuous grates and sealed burners, and with a nice big gas oven. No separate ovens. 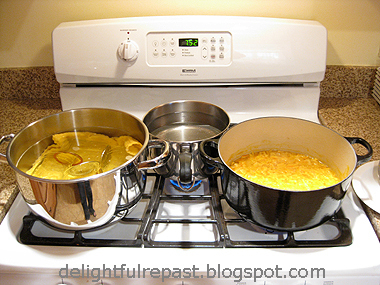 The way I cook, I could often use a second oven (electric); but there's no wall space to put one. You're right, it looks like sunshine in a glass! Coincidently, we just pulled several Meyer lemons off our tiny little tree we have. I could use those to make this. It does look like work but I bet it tastes great. Richard, I do think you are someone who would enjoy making marmalade - *and* sketching it! It makes the kitchen smell wonderful too. I certainly does look like sunshine! Love your new header, by the way. Lana, thank you! I don't know why I waited so long to get a custom header - just stupid, I guess! I am going to do this, Jean. We could use a little more sunshine right about now. Loved the D.H. Lawrence quotation. :-) Don't you long to be in Cumbria? After all, it is in your genes, girl! The marmalade looks marvelous. Wish I had some right now to go with my GF toast and English Breakfast tea. Judy, I DO long to be in Cumbria! So glad you're going to make this. You are going to love it - I think I'm addicted to it! I've been eating it every day, and each time I just can't get over how good it is! Citrus is just the best flavor! Thanks, Jenn. When I make things that are a lot of work, my husband always says "You sure know how to have fun"! Thanks for visiting my blog Jean, I am going to enjoy perusing all the wonderful recipes you share - and with lots of photos of the steps. I'm a new follower, right behind Bernideen. Judith, thank you so much! I have lots of teatime treats on my blog that you might enjoy. How well something goes with a cup of tea is my biggest concern about any baked good! 5 cleavers all the way (though cleaver-ing the fruit for marmalade may be a tad too enthusiastic)! Call it Ninja marmalade. Good marmalade is unique. And one doesn’t need intuition to know that your caramelized version stresses the uniqueness. Another 5 cleavers for the excellent photo guide. Your decorum with the camera is as good as your decorum with life’s rites and rituals. Methinks you’ve extended the Japanese tea ceremony to the rest of the pantry. At last a post to win the coveted, rarely bestowed Five Cleavers Award! The colorful subject inspired me to take more photos than I usually do. Thanks, Sully. would love to have you put this on my Open House Blog Party today! 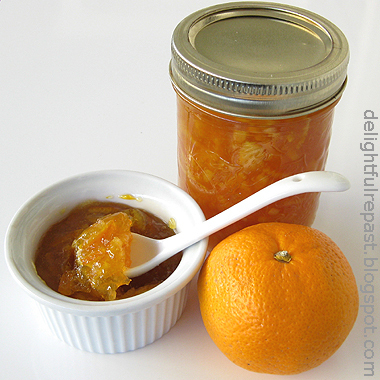 I made meyer lemon marmalade a couple years ago - maybe 3? It was fun.n Yours looks lovely! Thank you, Bernideen! I'll add it to your Blog Party right now. 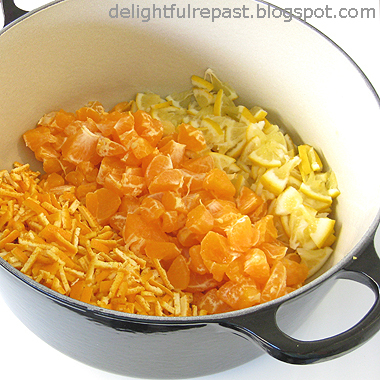 Making Meyer Lemon Marmalade next week. Sugar amount was what went wrong, wasn't it? Thanks for your comment on my blog Jean. My failed attempt actually had too much sugar - the result was bitterly too sweet. But I have had success since then so I'm a happier camper now :). Jenn, I haven't used grapefruit in my marmalade yet. But I'm thinking it has such bitter pith that probably you would have had a more pleasant result just using the zest and the fruit and throwing out the pith. I'll let you know when I do it. Satsuma is my favourite orange. Homemade marmalade tastes the best. Thanks, Angie. Glad you stopped by! Ooh, I've not made marmalade in years, and when I did, yes, bits did stick to the bottom and become glass-hard candy. Your tutorial is perfect. Soon's get a chance, I'll be making some too. By the way, your homestyle pork chops from "The Pork Chop Incident" were as lovely as promised, and since then our family has rediscovered the joys of chops. Thank you therefore! Natalie, thank you so much! You're too kind. As I'm rereading Pride and Prejudice this month, I'm wondering if there were any references to marmalade in any of Jane's works? Amen to the stirring while boiling! As if you want a burned pan bottom. Who comes up with this crap? Yeahhhh, I'd like to know too! Thanks, Mr. P.
Yeah--I'm not a fan of marmalade but I am a fan of Meyer Lemons and Delightful Repast! Your sunshiny marmalade looks delicious and reminds me of 'sunshine jam'--apricot--we used to make. Key to good sunshine jam is to put it on something with legs sticking in water so the ants can't get at it while it's curing in the sun! I am sending the recipe on to my sister. Hi Jean, thanks so much for the sensible approach to making marmalade. I have never made it, as a 42 year-old man, but my father sent me home from my Thanksgiving trip with 5.5 pounds of satsumas off his prolific tree and, let's face it, I can only eat so much. I followed your recipe exactly (pound for pound), temperature at 220, to a beautiful color somewhere between the two jars in your photo, but never got to a place where it felt much thicker than it was in the beginning. I couldn't get it to test using the freezer plate, so added a full box of Sure-Jell and cooked it longer, before canning/bathing. I eventually got a consistency somewhere between thick syrup and jam. Is that about right? It tastes delicious, and I'm excited to give the half-pints with a loaf of home-baked bread as Christmas gifts to co-workers. Should I reconsider this? I need to manage expectations! Robby, I'm so glad you liked the flavor and so sorry you ran into a little difficulty with it setting up. I'm thinking it could be one of two things: 1. 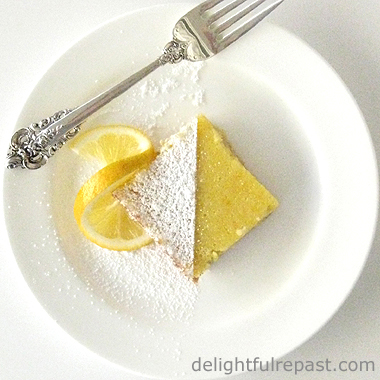 Did you use the exact weights of both satsumas and Meyer lemons? The reason I ask is that the lemon peel has a lot of pectin and is an important part of the recipe. 2. Did you double or triple the recipe? I have never tried that myself, but some recipes just don't do well when doubled or tripled. Also, it tends to thicken up in the jars after 24 hours or so. So if it seems "just right" when going into the jars, it can actually end up being too firm. I've only ever had the opposite problem of you -- I tend to make it too firm. But do let me know about these two questions -- we'll sort it out! your recipe calls for 1 1/2 quarts water, i just made satsuma marmalade using 2lbs satsumas, 3 cups water and 4 1/2 cups sugar, 2 tbsp lemon juice, it jelled nicely. I want to try your recipe with meyer lemons but it seems like a lot of water. Hi Michele, yes, I've made it many times with 1.5 quarts (6 cups) of water. I think you'll find that if you follow my directions exactly, it will turn out just right, though it's twice as much water as you're used to. Are you in the US? The reason I ask is that some of my readers from other countries are used to other types of measures, and that can lead to confusion. I'm glad you asked, though, because I would've felt terrible if you'd made it and it didn't turn out well and then we found that I'd made a typo! thank you so much for getting back with me, I'm looking forward to trying your recipe! Michele, I'm always happy to answer readers' questions. Do let me know how this turns out for you.